Al Bowman at a rally on the Quad in December 2012. So often administrators leave office with an asterisk at the end of their accomplishment list. The notation typically adds to the history books details of a crisis mishandled, poor judgment that sparked a scandal or disdain from those who endured the leader’s direct orders. As Al Bowman prepares to depart from the Illinois State presidency, he too has a significant footnote that will forever serve as an indicator of his decade at the University’s helm: There is universal lament for his departure. I’m the only one happy with my news,” Bowman said, referring to the announcement of his retirement. Immediately after sharing his decision in December of last year, Bowman heard from constituents across the campus, community and country who voiced their shock and dismay. 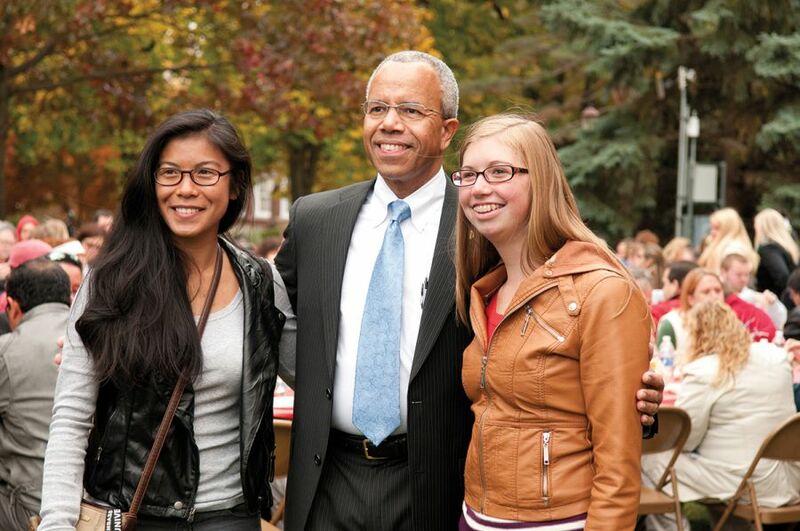 Gratitude has been the third emotion consistently expressed to Bowman, who became the 17th president on March 1, 2004, after serving one year in the office as interim. He remains at the helm while a national search for his replacement continues. President Bowman with students at Pig Out with the Prez on the Quad last fall. Stating a need to embrace a less stressful and demanding pace for the good of his long-range health, Bowman offered assurances that he is not abandoning the University he has served for 35 years in faculty and administrative roles. “Illinois State has been the center of my life. I will continue to be a proud Redbird and hope to make Illinois State University an important part of my life for years to come,” Bowman said in his official announcement. He will teach each semester and hold an office in the Department of Communication Sciences and Disorders. It was there he started his ISU career in 1978 as a faculty member in what was then the Department of Speech Pathology and Audiology. He arrived having completed a bachelor’s in speech pathology at Augustana College, a master’s in speech-language pathology from Eastern Illinois University, and while completing a doctorate at the University of Illinois in speech and hearing science. The classroom was his intended destination. His journey to the presidency began unexpectedly when his department chair retired and two in the faculty ranks vied for the position. Bowman was not interested in the post, which made him a perfect candidate to step in and unite the divided team. He led the department for eight years while teaching and serving as director of the Down Syndrome Speech-Language Clinic. Staff scholarly productivity doubled, the master’s program rose in prestige to its current ranking as No. 1 in Illinois, and accreditation by the Council on Academic Accreditation of the American Speech-Language Hearing Association was awarded. “I was ready to be department chair the rest of my life,” Bowman said. The fact he was content to remain in that position explains why those closest to him use the phrase “reluctant administrator” to describe Bowman’s journey to the presidency. ISU has been transformed into a first-choice public university under Bowman’s leadership. The transition was truly scripted by others at the University, who continued to seek his help in filling key positions. It was President Victor Boschini who opened Hovey Hall’s doors to Bowman, asking him to serve in 2002 as interim provost upon the departure of Al Goldfarb. In that role Bowman managed a $3.9 million rescission in Academic Affairs through targeted budget actions that preserved the quality and integrity of academic programs. When Boschini resigned the presidency a year later, Bowman’s dedicated service and reputation as a skilled manager resulted in yet another request for him to take on an interim role. The office became his following a national search. Those who have observed Bowman in the 10 years since concur that he truly was the right man for the job. 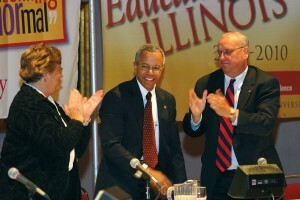 ISU has been transformed into a first-choice public university under Bowman’s leadership. For seven consecutive years, Illinois State was ranked as one of the top 100 public universities in the nation for quality and value by Kiplinger’s Personal Finance magazine. Several historic highs were achieved, including a freshman ACT score average of 24.3 and a freshman-to-sophomore retention rate of 85 percent. An Alumni Center was opened, classroom buildings were renovated and six residence halls remodeled. A $50 million student fitness center was constructed, as well as a 900-bed student apartment complex that became ISU’s first-ever public/private venture. The most significant change was the most difficult to achieve: Bowman managed to increase the level of pride for the University within the campus community and constituents, as well as the value alumni place on their degree. “There is a sense of pride associated with where ISU is today and a recognition that we have separated ourselves from the competition,” Bowman said. Campus constituents have noticed the elevated esteem of Redbirds and attribute it in part to Bowman’s sincere and caring demeanor that remains constant. His warmth is felt by students and legislators alike. The blueprint served Bowman so well that many on campus readily and regularly compare the two presidencies. The parallels were cemented when students gathered on the Quad just days after Bowman announced his resignation. They surprised Bowman with a secretly planned expression of thanks that included his wife, Linda; ISU cheerleaders; Reggie Redbird; members of the Big Red Marching Machine; and hundreds of students, faculty and staff who cheered for their beloved leader. 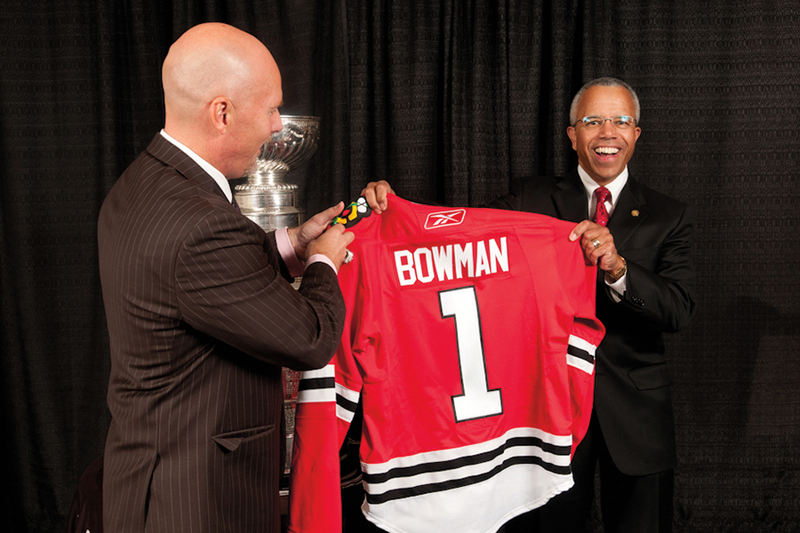 “That was without a doubt one of the best moments and memories of my presidency,” Bowman said. Others include completion of the University’s first comprehensive campaign, Redefining “normal,” and Illinois State’s advancement during a dreadful economic environment. Bowman accepts a Chicago Blackhawks jersey from alum (and Hawks executive) Jay Blunk. The same cannot be said for the majority of universities in Illinois. What sets Illinois State apart? Bowman answers with praise for the expertise of his leadership team that he relied on for candid assessments. Bowman also has sincere appreciation for faculty and staff who are dedicated to the success of students. He expresses pride in a stellar student body; and applauds alumni and friends who invest their time, talent and resources into the University’s programs and people. He also points to ISU’s strategic plan as a pivotal part of the University’s success. 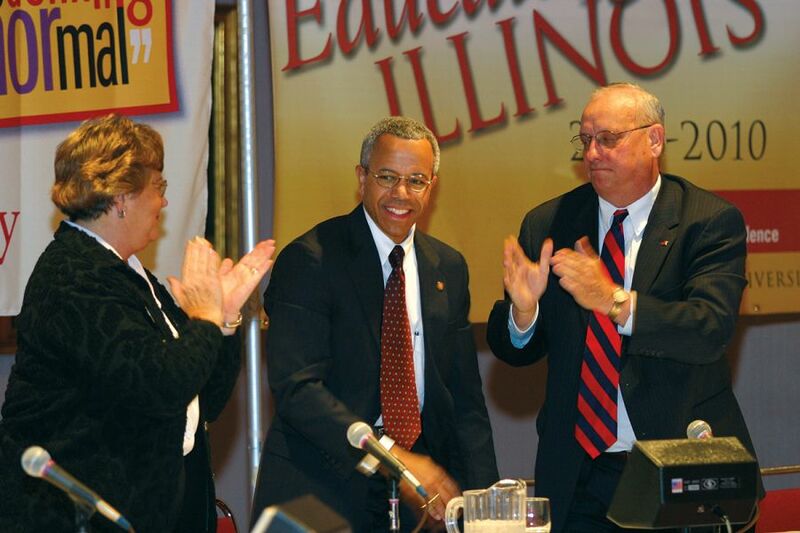 “In my opinion, the turning point for Illinois State came with Educating Illinois. The conversations initiated in the 1990s that resulted in the document addressed what kind of institution we wanted to be,” Bowman explained. The living document assured decisions made across campus bolstered the University’s core values, which include the pursuit of learning and scholarship, individualized attention, diversity, integrity and civic engagement. “We took an approach that is very different from most universities when we decided it would be a mistake to be all things to all people,” Bowman said, admitting he was cautious. An example he gives is the introduction of a renewable energy program, which is a unique major with high interest among incoming students. It was implemented with minimal cost given the infrastructure within the College of Applied Science and Technology. Another example of how Educating Illinois guided Bowman’s decisions is his strong stance against increasing class size or shifting the burden of teaching to graduate students instead of faculty members. Doing so would reduce the overall expense ledger but would also lower the academic experience, which Bowman deemed too high a cost. “We have faculty who compete in the national arena in their field, but who also value their teaching and interaction with students. That’s what makes us unique. That’s what has created a campus climate that people are talking about across the state,” Bowman said. He knows the banter from having invested hours at the state capital, where he enjoyed working as Illinois State’s advocate. Bowman never tired of explaining the University’s endeavors, excellence and needs. He equally delighted in meeting with potential donors, eagerly sharing with them opportunities to support ISU’s people and programs. Even the most difficult part of the job—balancing the needs and expectations of myriad stakeholders who have an attachment to the University—became a labor of love for Bowman, who readily acknowledges he had hoped to stay in office another four years. “I wanted to see the new facility for the College of Fine Arts completed and an addition to Milner Library finished,” Bowman said, admitting his retirement decision was made with difficulty. “I still love this job. If I could slow down a little and stay as president, I’d do it forever,” Bowman said, but the demand of 80-hour weeks that fuse his personal and professional life take a toll. Having just turned 60 and with the University on solid ground, he and his family deemed the time for transition had come. While aware that many on campus are concerned the momentum will slow when he departs, Bowman is confident Illinois State will continue on a strong projectory. And he is pleased he will remain on campus to watch and cheer the progress that is yet to come. The fact he has no desire to relocate in retirement, declining numerous job opportunities during the past decade, fulfills one of the first promises he made as president. Many have asked what they can do to express appreciation to the Bowmans. They have identified two areas close to their heart: ISU’s Eckelmann-Taylor Speech and Hearing Clinic, and the Bowman Fellows Program. Consider honoring their years of service by making a gift to either, or give to the area of campus that matches your passion. Go to IllinoisState.edu/Giving, call (800) 366-4478, or mail to Illinois State University Foundation, Campus Box 8000, Normal, IL 61790.